Wow! So sweet and simple. I love this so much and I don’t even knit (I crochet and I’m hoping wooden crochet needles will be just as lovely). I’ll be making this for my sister-in-law for sure. Thanks for the inspiration. Have a lovely day. Thank you, Elizabeth. I hope she enjoys it! That space came to life after our Christmas tree went out the door. It’s my new favorite corner. 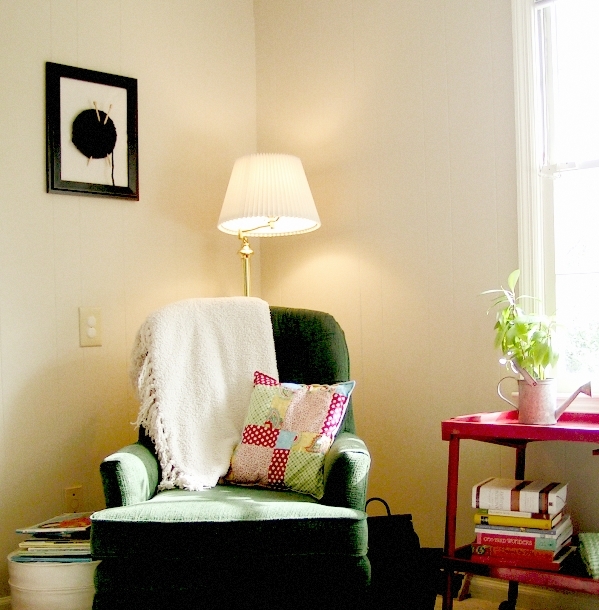 what a lovely touch to that bright and cozy looking corner! It is quite cozy. I’ve just got to make more time to actually sit in it! that does look like a really comfortable corner of your home. I love this project! ♥ Such a great idea, very clever. Thanks for sharing and happy Monday! Love this idea. I am a knitter as was my mother. When she passed away my dad gave me her knitting supplies, I think I will do this using her needles and yarn. Thank you for the great idea. Oh, wow. What a treasure. I have some of my grandmother’s knitting and crochet needles and I love having that tangible memory of her creativity. That is fabulous! I Love that Idea, I think it would also make a great Gift. Hi, Nancy! So nice to meet you. Thanks for introducing yourself. Your shop is lovely. I browsed your Friday Flea Market and I’ll have to go back and check out the rest. LOVE it! knitting meets modern art – have you notified MOMA? I will definitely make this. and i love your patchwork pillow. This is so gorgeous and clever! I am always looking for ways to personalize our home, to make it look like we live here, and not anyone else, you know? This is so lovely, and can really be adapted by using different yarn, needles, etc. Thank you so much for sharing!! What an incredible idea! I LOVE it. Goodness, I cannot wait to get started. You are brilliant. I love your toy organizer. That is brilliant!!! This is such an awesome idea. Now I know what to give my sister for her birthday next month. Thanks!! It’s nice to meet you too! What a lovely blog you have here, I’m going to stop back again sometime when I have more time. I love this! So, beautiful, I love how it comes out of the frame and off of the wall just a bit. Absolutely lovely! Good Lord. I love this. Once our house is finished, I am definitely going to be putting this on one of the walls. love this beautiful project idea. thank you for the inspiration. and thank you for your kind and wise reflections on love. 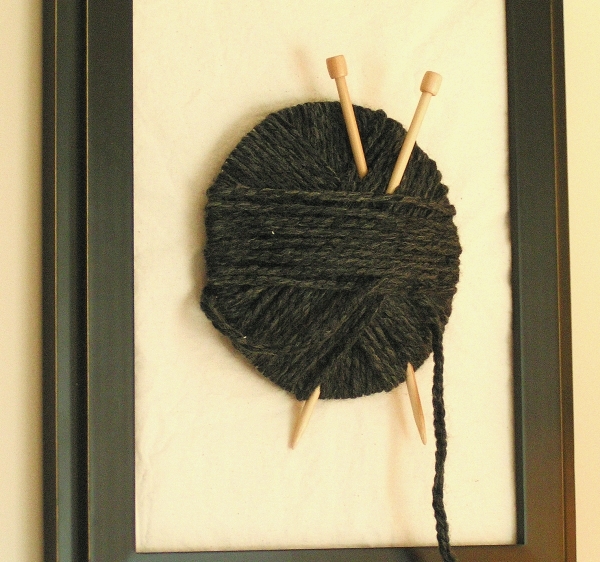 I love the chunky yarn and the frame and the wooden needles. What a great combo! Very fun project. This is SO cute. My friend Allison would LOVE this. I love how you chose black yarn. My mom who knits would get a kick out of this, fun! I’m thinking one of those would be perfect for my new studio!! this really is a must-do project for an knitter. i don’t knit, but my bff does, and i will absolutely make one for her! thank you so much for the tutorial! This is a *lovely* idea! I am going to make one of these for my craft room. Thank you so much for sharing! This is amazing, what a gorgeous project. Thank you so much for sharing! Ingenious! That’s so cute…..I love it! You are one creative mama! clever! and your special corner looks welcoming and cosy. You are absolutely right that in crafting so many of the mediums and tools are beautiful.This looks really very nice and cute.I also like this idea very much.Thank you very much for this useful post. i LOVE this. i am a newbie and just started sewing and knitting. i am so excited to have found your site!!!! this is cool ! it turned out great ! Whoa, I love this!!! Thanks so much. I can’t wait to create one. I’ll be linking as well. This is perfect!! As soon as I saw it I thought, “Why didn’t I think of that? ?” I love it! I love your art project and am going to give it a try. Thank you so much for sharing this with us. By the way, I saw it on One Pretty Thing and immediately popped over to visit your blog. This would look so cute in my spinning area! Very sweet idea. I like it! This is such a fabulous idea- thanks for sharing!